A double story began on the Syrian conflict, at the very beginning of the armed violence in 2011, in the southern border town of Daraa. The first story comes from independent witnesses in Syria, such as the late Father Frans Van der Lugt in Homs. They say that armed men infiltrated the early political reform demonstrations to shoot at both police and civilians. This violence came from sectarian Islamists. The second comes from the Islamist groups (‘rebels’) and their western backers, including the Washington-based Human Rights Watch. They claim there was ‘indiscriminate’ violence from Syrian security forces to repress political rallies and that the ‘rebels’ grew out of a secular political reform movement. 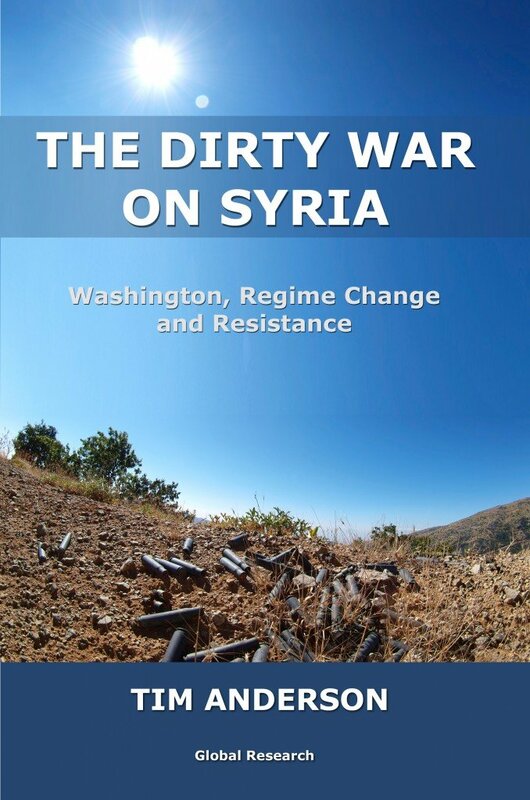 Careful study of the independent evidence, however, shows that the Washington-backed ‘rebel’ story, while widespread, was part of a strategy to delegitimise the Syrian Government, with the aim of fomenting ‘regime change’. To understand this it is necessary to study the outbreak of the violence in Daraa, in March 2011. Central to that insurrection were shipments of arms from Saudi Arabia to Islamists at the al Omari mosque. 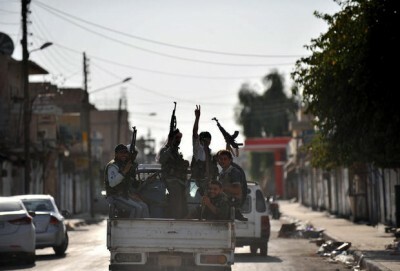 In early 2011 Syrians were well aware of a piece of history few western observers would remember: a strikingly similar Islamist insurrection took place in the town of Hama, back in 1982. Yet this was crushed within weeks by the Syrian Arab Army. Reviewing this conflict is useful because of the myths that have grown up around both insurrections. ‘At 2am on the night of 2-3 February 1982 an army unit combing the old city fell into an ambush. Roof top snipers killed perhaps a score of soldiers … [Brotherhood leader] Abu Bakr [Umar Jawwad] gave the order for a general uprising … hundreds of Islamist fighters rose … by the morning some seventy leading Ba’athists had been slaughtered and the triumphant guerrillas declared the city ‘liberated’ (Seale 1988: 332). ‘As the tide turned slowly in the government’s favour, the guerrillas fell back into the old quarters … after heavy shelling, commandos and party irregulars supported by tanks moved in … many civilians were slaughtered in the prolonged mopping up, whole districts razed’ (Seale 1988: 333). ‘The guerrillas were formidable opponents. They had a fortune in foreign money … [and] no fewer than 15,000 machine guns’ (Seale 1988: 335). Subsequent Muslim Brotherhood accounts have inflated the casualties, reaching up to ‘40,000 civilians’, and attempting to hide the vicious insurrection by claiming that Hafez al Assad had simply carried out a ‘civilian massacre’ (e.g. Nassar 2014). The then Syrian President blamed a large scale foreign conspiracy for the Hama insurrection. Seale observes that Hafez was ‘not paranoical’, as many US weapons were captured and foreign backing had come from several US collaborators: King Hussayn of Jordan, Lebanese Christian militias (the Israeli-aligned ‘Guardians of the Cedar’) and Saddam Hussein in Iraq (Seale 1988: 336-337). The Hama insurrection helps us understand the Daraa violence because, once again in 2011, we saw armed Islamists using rooftop sniping against police and government officials, drawing in the armed forces, only to cry ‘civilian massacre’ when they and their collaborators came under attack from the Army. Although the US, through its allies, played an important part in the Hama insurrection, when it was all over US intelligence dryly observed that: ‘the Syrians are pragmatists who do not want a Muslim Brotherhood government’ (DIA 1982: vii). ‘The Salafist, the Muslim Brotherhood and AQI [Al Qaeda in Iraq, later ISIS] are the major forces driving the insurgency in Syria … AQI supported the Syrian Opposition from the beginning, both ideologically and through the media’ (DIA 2012). In February 2011 there was popular agitation in Syria, to some extent influenced by the events in Egypt and Tunisia. There were anti-government and pro-government demonstrations, and a genuine political reform movement that for several years had agitated against corruption and the Ba’ath Party monopoly. A 2005 report referred to ‘an array of reform movements slowly organizing beneath the surface’ (Ghadry 2005), and indeed the ‘many faces’ of a Syrian opposition, much of it non-Islamist, had been agitating since about that same time (Sayyid Rasas 2013). These political opposition groups deserve attention, in another discussion. However only one section of that opposition was linked to the violence that erupted in Daraa. Large anti-government demonstrations began, to be met with huge pro-government demonstrations. In early March some teenagers in Daraa were arrested for graffiti that had been copied from North Africa ‘the people want to overthrow the regime’. It was reported that they were abused by local police, President Bashar al Assad intervened, the local governor was sacked and the teenagers were released (Abouzeid 2011). Yet the Islamist insurrection was underway, taking cover under the street demonstrations. On 11 March, several days before the violence broke out in Daraa, there were reports that Syrian forces had seized ‘a large shipment of weapons and explosives and night-vision goggles … in a truck coming from Iraq’. The truck was stopped at the southern Tanaf crossing, close to Jordan. The Syrian Government news agency SANA said the weapons were intended ‘for use in actions that affect Syria’s internal security and spread unrest and chaos.’ Pictures showed ‘dozens of grenades and pistols as well as rifles and ammunition belts’. The driver said the weapons had been loaded in Baghdad and he had been paid $5,000 to deliver them to Syria (Reuters 2011). Despite this interception, arms did reach Daraa, a border town of about 150,000 people. This is where the ‘western-rebel’ and the independent stories diverge, and diverge dramatically. The western media consensus was that protestors burned and trashed government offices, and then ‘provincial security forces opened fire on marchers, killing several’ (Abouzeid 2011). After that, ‘protestors’ staged demonstrations in front of the al-Omari mosque, but were in turn attacked. The Syrian government, on the other hand, said that armed attacks had begun on security forces, killing police and civilians, along with the burning of government offices. There was foreign corroboration of this account. While its headline blamed security forces for killing ‘protesters’, the British Daily Mail (2011) showed pictures of guns, AK47 rifles and hand grenades that security forces had recovered after storming the al-Omari mosque. The paper noted reports that ‘an armed gang’ had opened fire on an ambulance, killing ‘a doctor, a paramedic and a policeman’. Media channels in neighbouring countries did report on the killing of Syrian police, on 17-18 March. On 21 March a Lebanese news report observed that ‘Seven policemen were killed during clashes between the security forces and protesters in Syria’ (YaLibnan 2011), while an Israel National News report said ‘Seven police officers and at least four demonstrators in Syria have been killed … and the Baath party headquarters and courthouse were torched’ (Queenan 2011). These police had been targeted by rooftop snipers. Even in these circumstances the Government was urging restraint and attempting to respond to the political reform movement. President Assad’s adviser, Dr Bouthaina Shaaban, told a news conference that the President had ordered ‘that live ammunition should not be fired, even if the police, security forces or officers of the state were being killed’. Assad proposed to address the political demands, such as the registration of political parties, removing emergency rules and allowing greater media freedoms (al-Khalidi 2011). None of that seemed to either interest or deter the Islamist insurrection. Several reports, including video reports, observed rooftop snipers firing at crowds and police, during funerals of those already killed. It was said to be ‘unclear who was firing at whom’ (Al Jazeera 2011a), as ‘an unknown armed group on rooftops shot at protesters and security forces’ (Maktabi 2011). Yet Al Jazeera (2011b) owned by the Qatari monarchy, soon strongly suggested that that the snipers were pro-government. ‘President Bashar al Assad has sent thousands of Syrian soldiers and their heavy weaponry into Derra for an operation the regime wants nobody in the word to see’. However the Al Jazeera suggestion that secret pro-government snipers were killing ‘soldiers and protestors alike’ was illogical and out of sequence. The armed forces came to Daraa precisely because police had been shot and killed. ‘It was on the first of April and about 18 or 19 security forces … were killed’ (Narwani 2014). Deputy Foreign Minister Faisal Mikdad, himself a resident of Daraa, confirmed that: ‘this incident was hidden by the government … as an attempt not to antagonize or not to raise emotions and to calm things down – not to encourage any attempt to inflame emotions which may lead to escalation of the situation’ (Narwani 2014). Yet the significance of denying armed anti-Government killings was that, in the western media, all deaths were reported as (a) victims of the Army and (b) civilians. For well over six months, when a body count was mentioned in the international media, it was usually considered acceptable to suggest these were all ‘protestors’ killed by the Syrian Army. For example, a Reuters report on 24 March said Daraa’s main hospital had received ‘the bodies of at least 37 protestors killed on Wednesday’ (Khalidi 2011). Notice that all the dead had become ‘protestors’, despite earlier reports on the killing of a number of police and health workers. Another nineteen soldiers were gunned down on 25 April, also near Daraa. Narwani obtained their names and details from Syria’s Defence Ministry, and corroborated these details from another document from a non-government source. Throughout April 2011 she calculates that eighty-eight Syrian soldiers were killed ‘by unknown shooters in different areas across Syria’ (Narwani 2014). She went on to refute claims that the soldiers killed were ‘defectors’, shot by the Syrian army for refusing to fire on civilians. The Washington based group Human Rights Watch, referring to interviews with 50 unnamed ‘activists’, claimed that soldiers killed at this time were all ‘defectors’, murdered by the Army (HRW 2011b). Yet the funerals of loyal officers, shown on the internet at that time, were distinct. Even Rami Abdul Rahman, keen to blame the Army for killing civilians, said ‘this game of saying the Army is killing defectors for leaving – I never accepted this’ (Narwani 2014). Nevertheless the highly charged reports were confusing, in Syria as well as outside. The violence spread north, with the assistance of Islamist fighters from Lebanon, reaching Baniyas and areas around Homs. On 10 April nine soldiers were shot in a bus ambush in Baniyas. In Homs, on April 17, General Abdo Khodr al-Tallawi was killed with his two sons and a nephew, and Syrian commander Iyad Kamel Harfoush was gunned down near his home. Two days later, off-duty Colonel Mohammad Abdo Khadour was killed in his car (Narwani 2014). North American commentator Joshua Landis (2011a) reported the death of his wife’s cousin, one of the soldiers in Baniyas. Al Jazeera, the principal Middle East media channel backing the Muslim Brotherhood, blacked out these attacks, as also the reinforcement provided by armed foreigners. Former Al Jazeera journalist Ali Hashem was one of many who resigned from the Qatar-owned station (RT 2012), complaining of deep bias over their presentation of the violence in Syria. Hashem had footage of armed men arriving from Lebanon, but this was censored by his Qatari managers. ‘In a resignation letter I was telling the executive … it was like nothing was happening in Syria.’ He thought the ‘Libyan revolution’ was the turning point for Al Jazeera, the end of its standing as a credible media group (Hashem 2012). Provocateurs were at work. Tunisian jihadist ‘Abu Qusay’ later admitted he had been a prominent ‘Syrian rebel’ charged with ‘destroying and desecrating Sunni mosques’, including by scrawling the graffiti ‘There is no God but Bashar’, a blasphemy to devout Muslims. This was then blamed on the Syrian Army, with the aim of creating Sunni defections from the Army. ‘Abu Qusay’ had been interviewed by foreign journalists who did not notice he was not Syrian (Eretz Zen 2014). ‘The issue of defectors is a distraction. Armed resistance began long before defections started … Every day the opposition gives a death toll, usually without any explanation … Many of those reported killed are in fact dead opposition fighters but … described in reports as innocent civilians killed by security forces … and every day members of the Syrian Army, security agencies … are also killed by anti-regime fighters’ (Rosen 2012). A numbers game was being played to delegitimise the Syrian Government (‘The Regime’) and the Syrian Army (‘Assad loyalists’), suggesting they were responsible for all the violence. Just as NATO forces were about to bomb Libya and overthrow the Libyan Government, US voices began to demand that President Assad step down. The Brookings Institution (Shaikh 2011) claimed the President had ‘lost the legitimacy to remain in power in Syria’. US Senators John McCain, Lindsay Graham and Joe Lieberman said it was time ‘to align ourselves unequivocally with the Syrian people in their peaceful demand for a democratic government’ (FOX News 2011). The big powers began to demand yet another ‘regime change’. In June, US Secretary of State Hilary Clinton dismissed the idea that ‘foreign instigators’ had been at work, saying that ‘the vast majority of casualties have been unarmed civilians’ (Clinton 2011). In fact, as Clinton knew very well, her Saudi Arabian allies had armed extremists from the very beginning. Her casualty assertion was also wrong. The United Nations (which would later abandon its body count) estimated from several sources that, by early 2012, there were more than 5,000 casualties, and that deaths in the first year of conflict included 478 police and 2,091 from the military and security forces (OHCHR 2012: 2; Narwani 2014). That is, more than half the casualties in the first year were those of the Syrian security forces. That independent calculation was not reflected in western media reports. ‘Watchdog’ NGOs such as Human Rights Watch, along with US columnists (e.g. Allaf 2012), continued to claim, well into 2012, that Syrian security forces had been massacring ‘unarmed protestors’, that the Syrian people ‘had no choice’ but to take up arms, and that this ‘protest movement’ had been ‘overwhelmingly peaceful until September 2011’ (HRW 2011a, HRW 2012). In fact, the political reform movement had been driven off the streets by Salafi-Islamist gunmen, over the course of March and April. 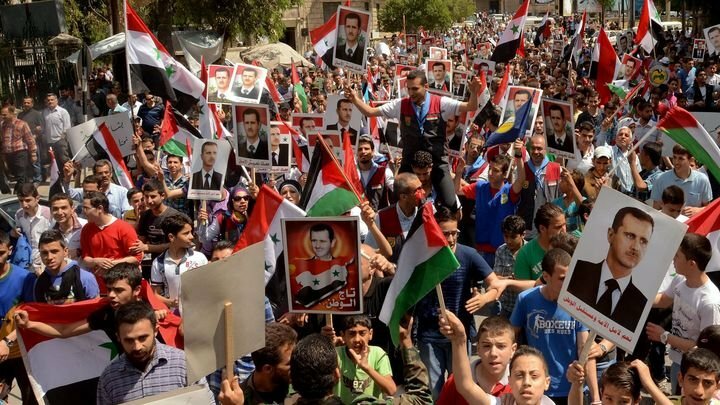 In June reporter Hala Jaber (2011) observed that about five thousand people turned up for a demonstration at Ma’arrat al-Numan, a small town in north-west Syria, between Aleppo and Hama. She says several ‘protestors’ had been shot the week before, while trying to block the road between Damascus and Aleppo. After some negotiations which reduced the security forces in the town, ‘men with heavy beards in cars and pick-ups with no registration plates’ with ‘rifles and rocket-propelled grenades’ began shooting at the reduced numbers of security forces. A military helicopter was sent to support the security forces. After this clash ‘four policemen and 12 of their attackers were dead or dying. Another 20 policemen were wounded’. Officers who escaped the fight were hidden by some of the tribal elders who had participated in the original demonstration. When the next ‘demonstration for democracy’ took place, the following Friday, ‘only 350 people turned up’, mostly young men and some bearded militants (Jaber 2011). Five thousand protestors had been reduced to 350, after the Salafist attacks. ‘I am a Syrian citizen and I am a human. After 4 months of your fake freedom … You say peaceful demonstration and you shoot our citizen. From today … I am [now] a Sergeant in the Reserve Army. If I catch anyone … in any terrorist organization working on the field in Syria I am gonna shoot you as you are shooting us. This is our land not yours, the slaves of American fake freedom’ (al Akhras 2011). Haidar, Ali (2013) interview with this writer, Damascus 28 December. Ali Haidar was President of the Syrian Social National Party (SS NP), a secular rival to the Ba’ath Party. In 2012 President Bashar al Assad incorporated him into the Syrian government as Minister for Reconciliation.